MARGAO: The otherwise fascinating Zalor beach that attracts tourists as well as locals wore an ugly look on Sunday as it has been invaded by tar balls that usually make their appearance just before the monsoons. People venturing into the sea complained of a slimy feel as the tar balls touch their body and left it greasy. Carmona Sarpanch, Allwyn Jorge while pointing out that the tar balls are nothing but waste oil and sludge that is rampantly discharged by the various vessels operating in the seas. He lamented that the government is not dealing with this phenomenon seriously and has actually taken it for granted that it will happen every summer and just needs to be cleaned. “There is absolutely no coastal monitoring here and we wonder whether Marpol Regulations are followed in Goa,” he said adding that the panchayat will write to the Goa State Pollution Control Board, the Captain of Ports and Mercantile Marine Department to look into the matter. He said the situation is worse for the visitors as there are no changing rooms on the beach and they have to remain with the polluted clothes for long. 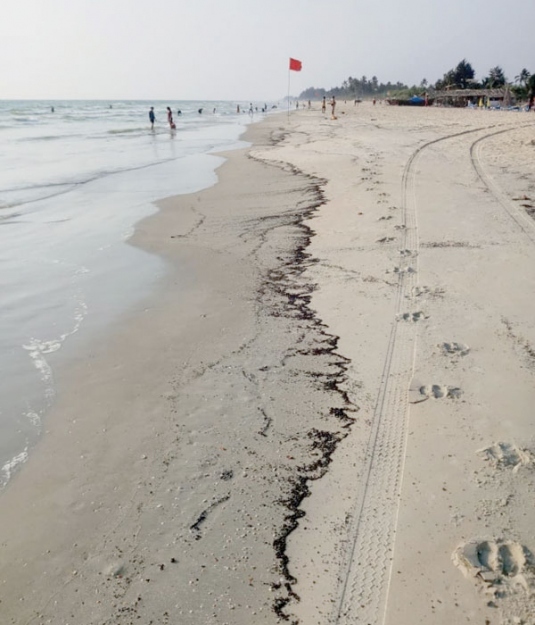 It may be recalled that tar balls had surfaced on Wednesday on the Anjuna and Candolim beach stretch causing inconvenience to tourists walking and bathing off the beach.